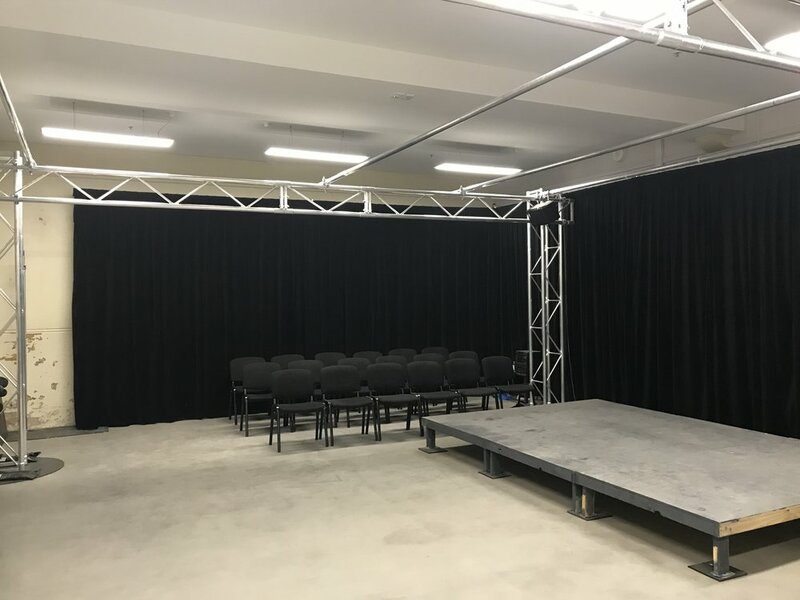 The Q44 Theatre studio at the Abbotsford Convent is a multi-use space, able to accommodate a range of users and uses including performance, exhibition, rehearsal, event and corporate/meeting. The space has plenty of natural light, sound dampening drapes (moveable) and a truss system for rigging lighting, sound and artwork (also moveable). We have seating for up to 60 patrons and can configure the room with tables for any use (cafe/cabaret, boardroom etc). Removable staging (3: 1200x2400x300) is also available. In the newly renovated Sacred Heart Building of the Abbotsford Convent, the space includes access to a common room (fridge, tea/coffee making facilities, oven, lounge, communal table for 10), toilets (accessible) and showers. On site is a range of catering/food options including Lentil As Anything, Abbotsford Convent Bakery and Cams (cafe, licensed restaurant). A member of the Q44 Theatre team will meet hirers at the commencement of each hire to open the venue and discuss any requirements they may have. Some date restrictions apply around the Q44 Main Stage Season performances.